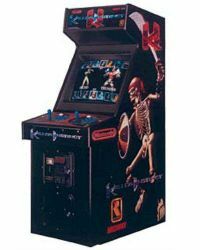 Killer Instinct is an arcade cabinet. It is the first game in the Killer Instinct series. A fighting game with a series of fantasy themed characters. The graphics it used were considered 'advanced' for its time, much like Donkey Kong Country. This game was later released on the Super Nintendo and Game Boy but with 'less advanced' graphics. Compensating for this, the Super Nintendo Entertainment version features two additional modes. This page was last edited on 6 April 2019, at 15:20.